It's definitely one of a kind. I never seen a cross lying down like this. It's more like not my thing though when it comes to necklaces. I am not into jewelries and my husband either so I know nothing of the thing. hehehe... But that necklace on the photo is quite lovely though. I am sure it would make a great gift. I don't think I would buy a sideways cross, not my style. I would buy it if it isn't sideways. very uniquely designed jewelry. perfect for mother's day gift ideas. 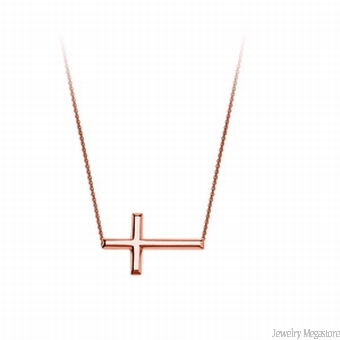 I have seen similar necklaces like this but not exactly the cross pendant. It looks so chic. i love fashion jewelry especially if they are affordable. i visited the site and yeah mom their products are tempting.. If my Paypal has fund will surely shop online..
you're right, a jewelry can be a great mother's day gift. shower you mom with a nice necklace or pair of earrings. Such a cute piece of jewelry. Rose gold is trending nowadays. Like you, I'm not the type to wear jewelry but I like that sideways cross! Your sideways cross necklace looks so elegant. I'm sure that will more enhance your real beauty.